The PolyFoam safety pad is ideal for use beneath commercial and residential playground systems that utilize synthetic turf, rubber mulch, or wood chips. It's easy to install, meets ASTM fall height requirements, and is made from recycled materials. 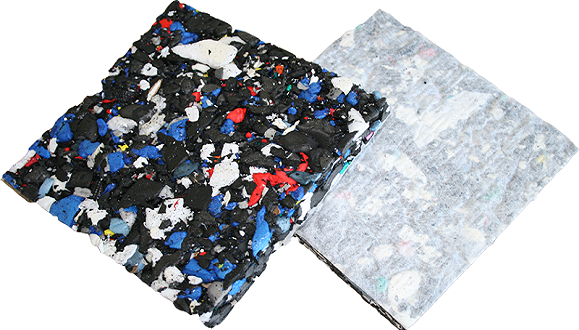 The PolyFoam playground pad is made from 100% recycled, non-contaminated post-industrial cross-link closed-cell polyethylene foam. This environmentally friendly safety and drainage pad is 100 percent recyclable. Children can get many more hours and days of benefit from your playground because of how efficiently the PolyFoam safety pad drains water. Oftentimes, children can be back at play within 15-20 minutes after a rainfall. The PolyFoam pad drains over 36 gallons per square foot vertically and up to 7.25 gallons per hour horizontally. The PolyFoam playground pad is free of rubber, lead, and other heavy metals. It's also anti-microbial, which makes it resistant to bacteria and fungus growth. Depending on local soil conditions, the PolyFoam playground pad can be used as a partial or total replacement of crushed stone beneath turf. This saves you time and money while making installation considerably faster than standard stone surfaces. The PolyFoam pad is easy to install and has the best cost/benefit ratio of any drainage/shock attenuation pad on the market today. The PolyFoam playground safety pad meets ASTM fall height requirements for playground safety. It is highly elastic and will retain its great shock absorption characteristics for many years, providing your playground years of consistent safe 1292-04 HIC and GMAX Ratings.